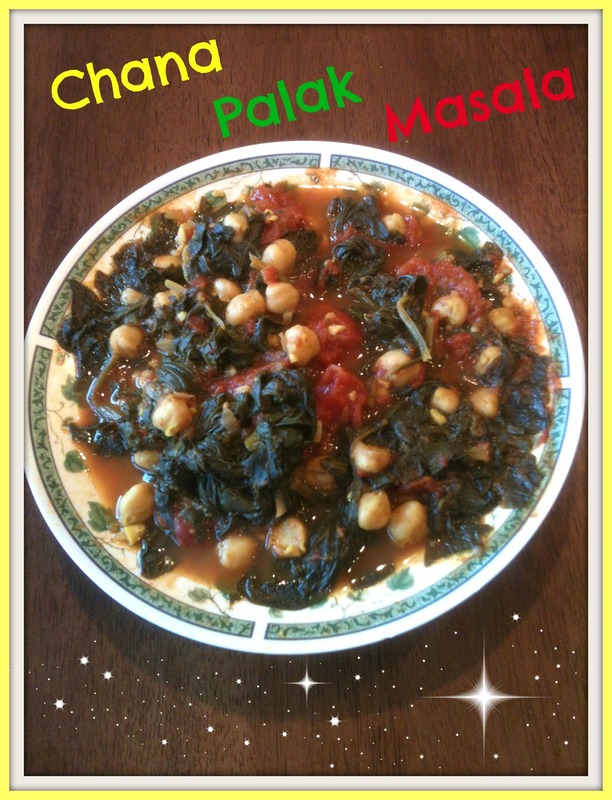 If you love chickpeas and spinach as much as I do, then you will love this recipe! It is very simple and can be made very quickly. It is quite spicy though, so if you do not like spice, I recommend omitting those seasonings or replacing the spicy seasonings with some of your favorites! 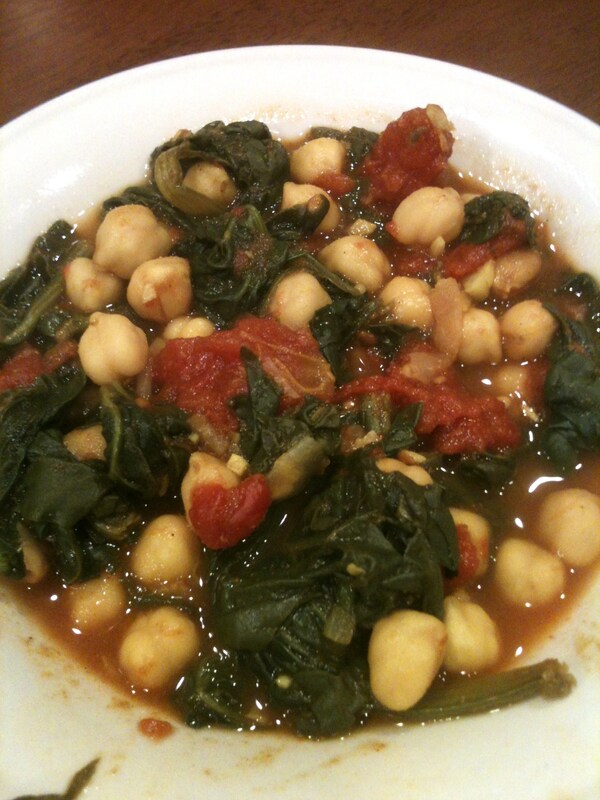 Chickpeas, spinach, and tomatoes can taste great with any seasonings! In a large pot, saute garlic and onions in 1/4 cup water until onions are translucent. 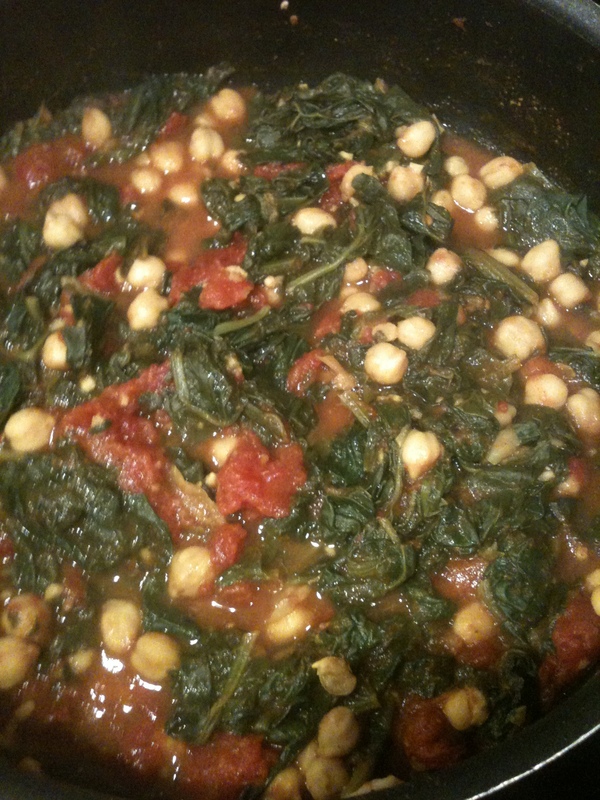 Add spinach, chickpeas, tomatoes (with the juice from the can), and vegetable broth. Cover and cook over medium heat until spinach cooks down and is deep green. Uncover and break tomatoes apart with a spoon. Add all spices (except garam masala) and the lemon juice. Add 1/2 tsp garam masala and cook for 2 more minutes. Taste and add the other 1/2 tsp garam masala, salt, and pepper if desired. Turn heat off and allow to sit for 5 minutes before serving. 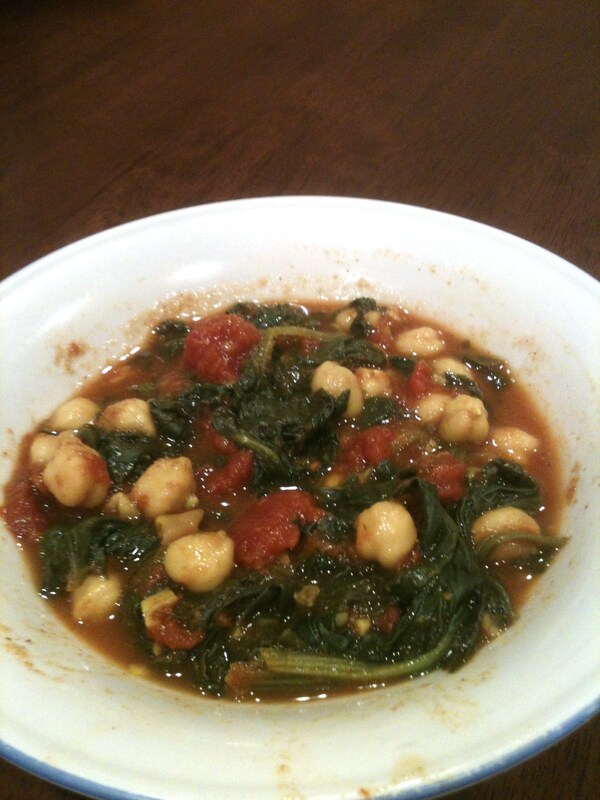 When I made this, I really like spicy food, so I added the whole 1 tsp garam masala. I did not add any salt or pepper and thought the taste was fine. The original recipe also calls for 1/2 tsp coriander, but I did not have this seasoning so just omitted it. All the other spices gave this recipe plenty of delicious flavoring. This recipe yields 2 servings. One serving yields approximately 350 calories and 18.5g protein. I love smoothies! I try to have one once a day for extra nutrients (from fruits and veggies) and protein (when I add protein powder), but of course during the winter it was really hard to want to drink an ice cold smoothie. Now that the warmer Spring weather has finally arrived, I have been enjoying a smoothie daily when I get home from work as a great afternoon snack. Since my smoothies are filled with fruits, some veggies I sneak in, and usually protein powder, my smoothies give me a great boost of energy which is perfect as a pick-me-up after work. This smoothie I made today was so good that I knew immediately I had to post it because it is definitely a smoothie I will want to make again! Directions: Place everything in a blender and blend until smooth! I actually haven’t tried this smoothie with the protein powder. I try not to use protein powders unless I feel like I did not get enough protein in my day from wholefoods. I’m sure it tastes fine in this smoothie though, most of my smoothies are made with vanilla protein powder and I absolutely love the taste! So if you want an extra bit of protein in your day I highly recommend adding the vanilla protein powder. This recipe makes one smoothie. Without the protein powder, this recipe yields approximately 255 calories and 5.5g protein. With Sunwarrior Vanilla Protein Powder, this recipe yields approximately 295 calories and 13g protein. This past weekend I was in a cooking mood and decided to make some Sloppy Joes. 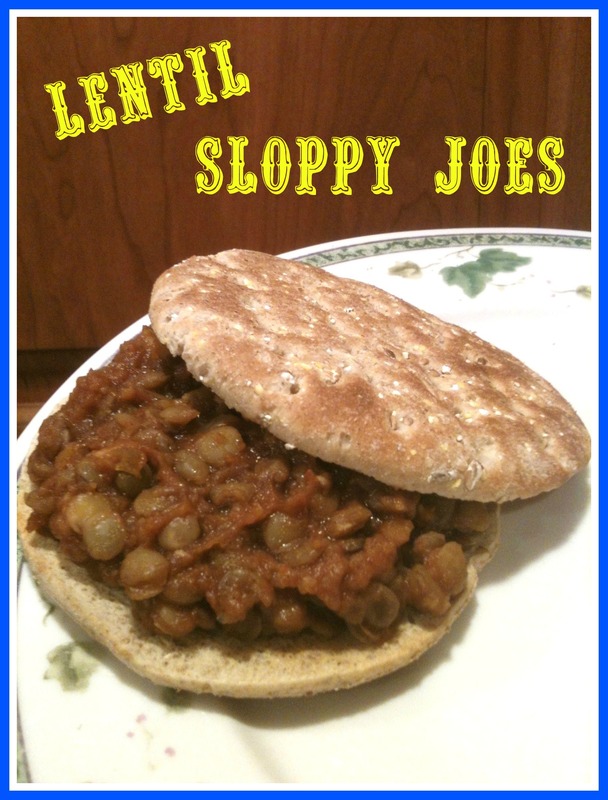 In the past, I made these TVP Sloppy Joes but I’ve been trying to limit my intake of soy and I remember reading about using lentils instead. I changed a lot of ingredients to suit my own (and my family’s) tastebuds and the meal turned out incredible. I immediately knew I would have to post this recipe so I could make this meal again! When the lentils are almost soft, after about 40 minutes, add the bell pepper, onion, and garlic. Cook an additional 5 minutes. Add all other ingredients and continue to simmer over low heat until thick. About 10-15 minutes. Allow to cool slightly before serving on top of a bun! You can also add additional toppings if you want. I bet these would be amazing with slices of avocado! There are a lot of ingredients to this meal, but there is very minimal chopping (especially if you use a food processor like I did), and most of the spices that need to be measured out use the same measuring spoon so there is very little clean up. 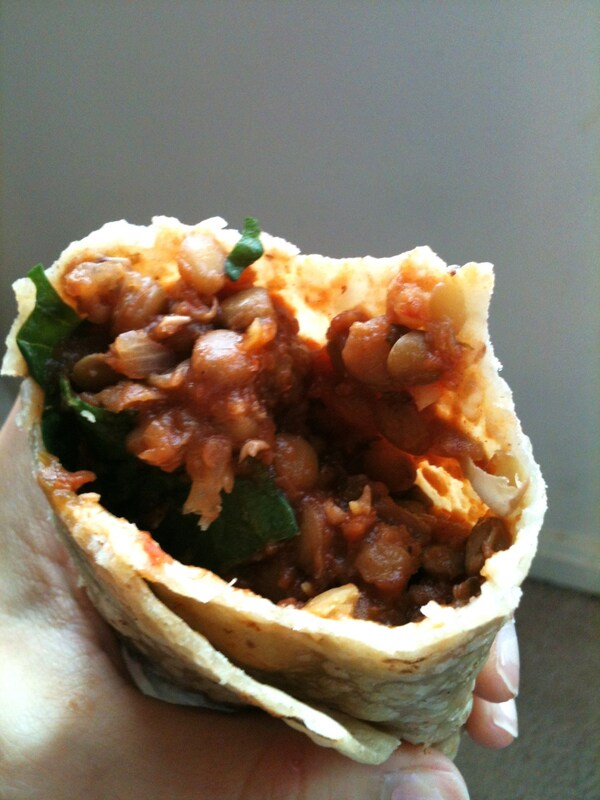 Sloppy Joe Wrap with spinach! One serving (without bread or other additional toppings) yields approximately 93 calories and 7g protein. Being a banana lover I always have bananas on hand. Spotted ones ripe enough to bake with or freeze for smoothies, yellow ones perfect for eating as they are, and green ones already ripening so that when my yellow bananas are all eaten the previous green ones are ready to go! Normally, it is very rare for me to have extremely brown/black bananas, but this rare occasion actually happened. I had the blackest bananas I think I have ever had in my entire life. I knew it was time to bake something with these bananas, after all black bananas are the best to bake with. I couldn’t decide if I wanted to try a banana bread or a banana muffin. 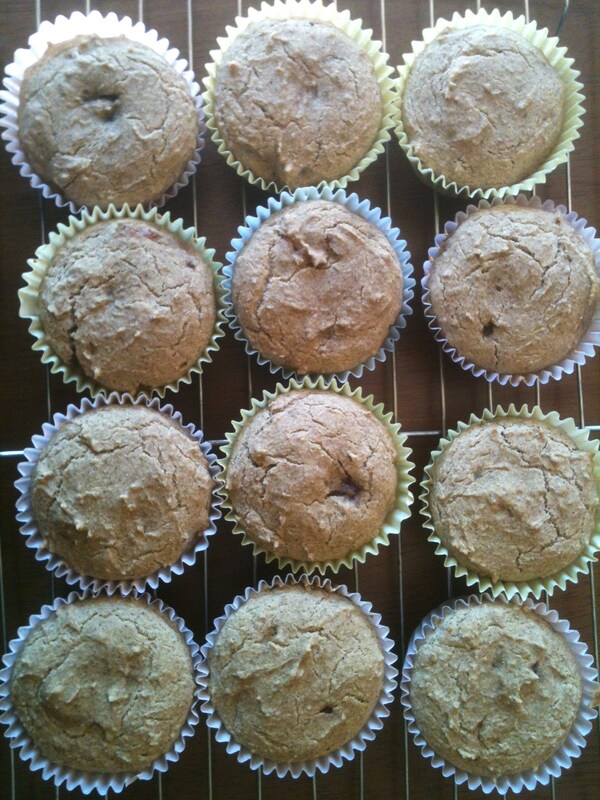 I eventually decided on the muffin, but then I thought why not make these muffins even better and add peanut butter, which always makes bananas taste so much better. 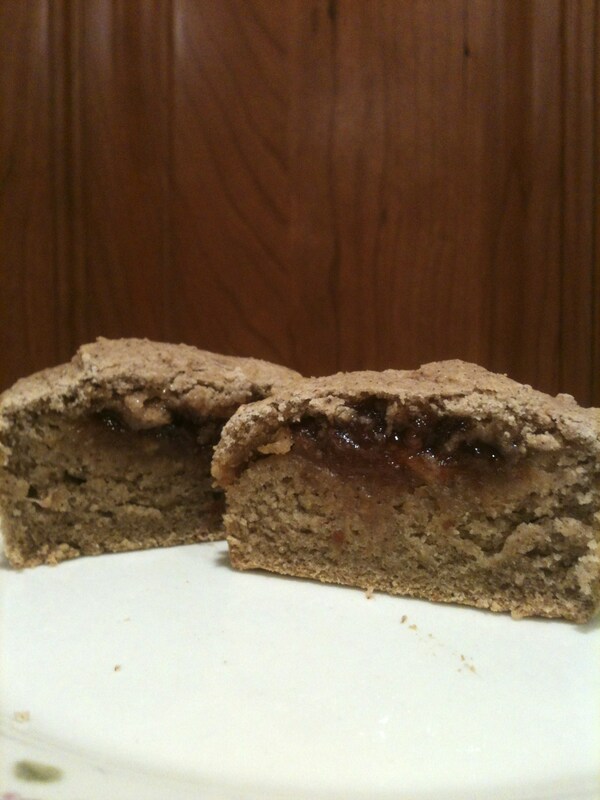 As I was searching around looking for a perfect vegan and gluten free recipe, I came across one that was for Peanut Butter and Jelly Banana Muffins. OMG! 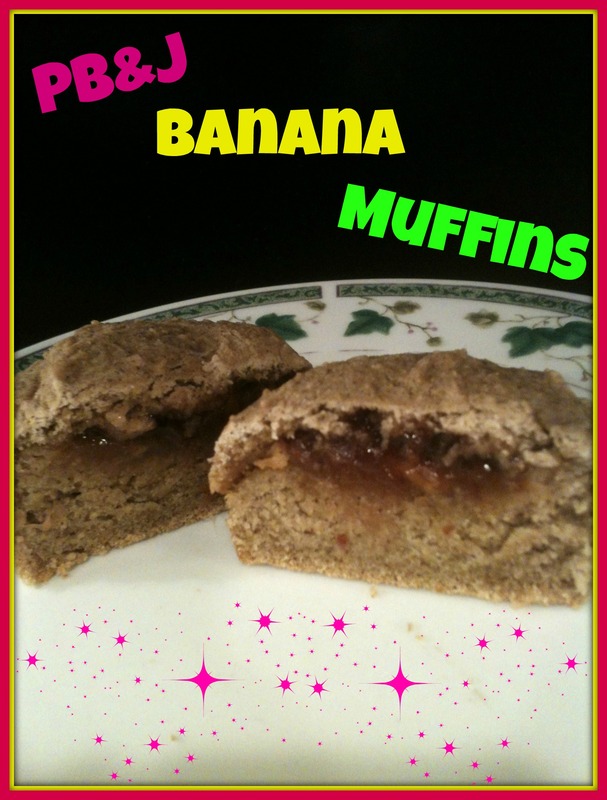 I love adding bananas to peanut butter and jelly sandwiches so having this combination in a muffin would be heaven! Preheat oven to 350F and line a muffin tin with 12 cupcake liners. In a food processor, blend garbanzo beans with about 2 tbsp almond milk. Add bananas, agave, coconut sugar, melted coconut oil, and vanilla extract to the garbanzo bean puree and blend until smooth. Transfer the wet mixture to a mixing bowl. Stir in baking powder, salt, cinnamon, and flour. Mix until well combined. Place a very small spoonful of the batter (just enough to cover the bottom) in each of the cupcake liners. 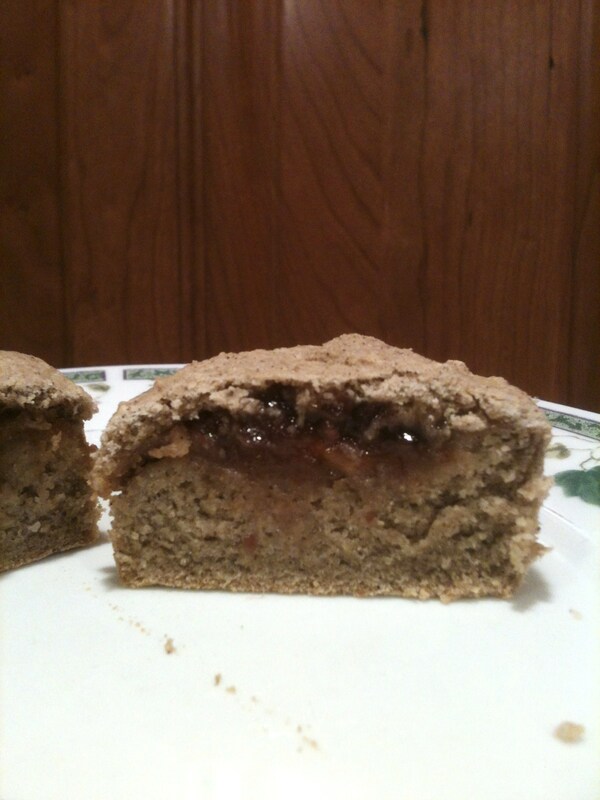 Take 1 tsp of peanut butter and 1 tsp of jam and place on top of each batter in the cupcake liners. Place another spoonful of the batter on top of each muffin to cover the peanut butter and jelly. Gently spread the top batter so that the top of each muffin is flat and not showing any peanut butter or jelly. Bake for about 20 minutes. Remove and allow to cool before serving! These muffins are extremely easy to make! The hardest part was taking a tsp of the peanut butter and jelly to place inside each muffin, but these muffins are totally worth that little effort. These muffins are perfect for breakfast, snack, or dessert! When making these muffins, the best part is you can decide how much peanut butter and jelly you want inside. You can add extra peanut butter, extra jelly, just peanut butter, just jelly, more of both, less of both…there are endless possibilities. I guess it all depends on if you like peanut butter or jelly more. Based on making 12 muffins, each muffin yields approximately 165 calories and 2.5g protein. 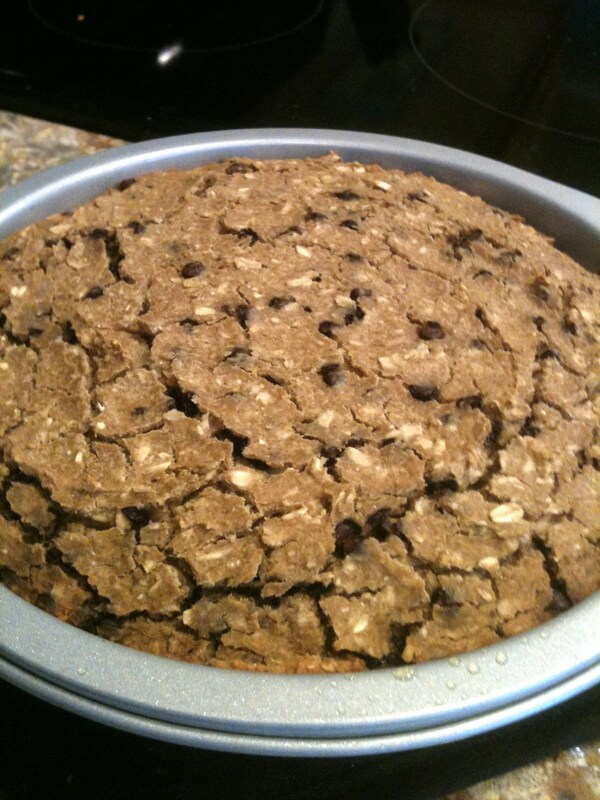 This Chocolate Chip Cookie Cake was like eating a huge soft chocolate chip cookie in cake form. Even though this is a sweet dessert recipe, it has a healthy secret ingredient…chickpeas! But trust me, unless you were told there are beans in this recipe, no one would ever guess. I adapted the original recipe quite a bit. Instead of using oil, I used a mashed banana. Since banana gives natural sweetness I cut back on the amount of sugar. I also cut back on the chocolate chips, but you can use however many chocolate chips you want! I cut back on a lot of the sugar because I eat so clean that too much sugar is too sweet for me so I recommend checking out the original recipe too and adapting the sugar to your taste buds. I found the amount of sugar and chocolate chips I used in my adapted recipe to be perfect for me. Preheat oven to 350F and grease a 10-inch springform pan with non-stick spray. With a wooden spoon, stir in chocolate chips. Pour batter into prepared pan and bake for about 40-45 minutes, or until toothpick inserted in center comes out clean. Once it is finished baking, allow to cool for 10 minutes, then remove the cake from the pan and place on a wire rack until completely cool. This cake is best eaten warm, either right from the oven or slightly warmed in the microwave. If you love giant, soft chocolate chip cookies, you will love this dessert. I can’t wait to make this tasty treat again! And since it is such a simple recipe with very minimal cleaning, I will definitely be making this dessert A LOT! Plus, it is a dessert you can eat guilt-free since it contains those healthy chickpeas! 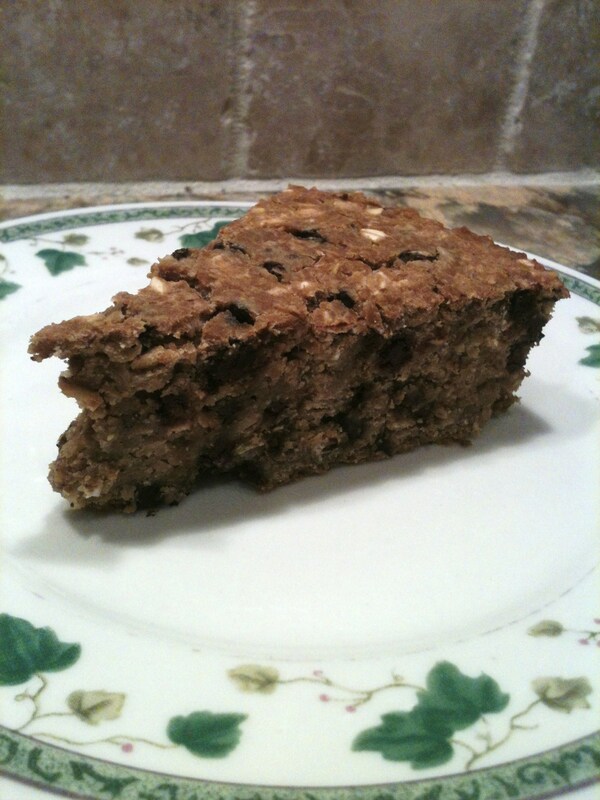 Based on slicing this cake into 8 pieces, each piece yields approximately 279 calories and 8.5g protein. Over Christmas I made my first risotto, Butternut Squash Risotto to be exact. 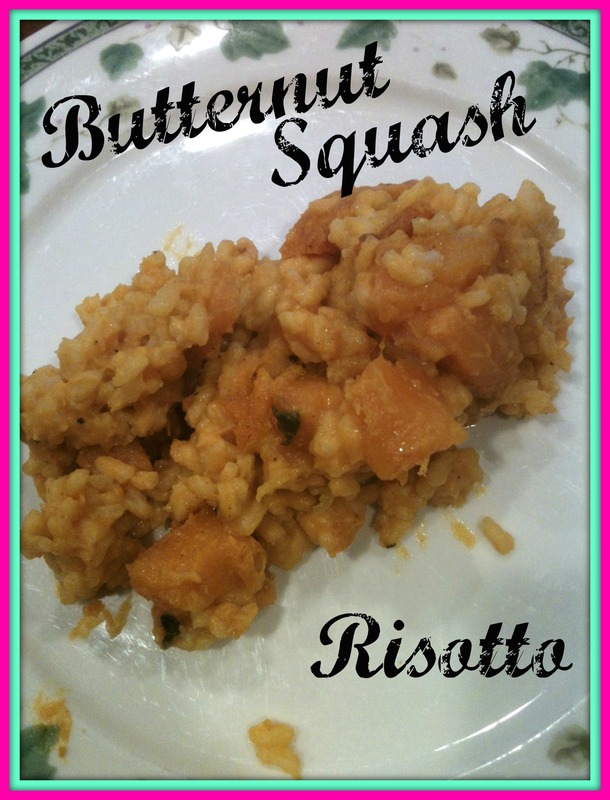 However, I encountered a lot of problems cooking the recipe: I made too much squash, I started the risotto before making the sauce, I then added too much sauce, and it came out more like a soup. It still tasted good, but I wanted to perfect the recipe before posting it on my blog. Since risotto is not the easiest meal to make, I hadn’t made the risotto again before now. I figured Easter would be a perfect opportunity to invest a little extra cooking time and try the recipe out again. And the second time…it was a huge success! In fact, it was such a success, I think next time I may have to double the recipe! Preheat oven to 450F. Line a baking sheet with foil and spray with non-stick spray. Place cut up butternut squash in a large bowl. Add olive oil, paprika, sage leaves, and salt and pepper. Mix to evenly coat the squash. Place butternut squash on the prepared baking sheet and bake in the oven for about 45 minutes, or until soft. Once the squash is done, begin making the sauce. Put 3/4 of the squash into a large bowl. Add 2 tbsp of water, the nutritional yeast, apple cider vinegar, lemon juice, and salt. Using an immersion blender, combine all ingredients until smooth and creamy. (Alternatively, you can combine all sauce ingredients in a blender.) Set aside. Once the rice is al dente, slowly stir in the sauce mixture. You want the risotto to be creamy, and to have a good bite, not soupy (I had a little leftover sauce). Add the remaining squash pieces (you may want to first cut the squash into even smaller pieces) and gently stir to combine. If desired, garnish with additional chopped sage leaves. Even though risotto is very time consuming, if there is a special holiday or other occasion coming up, this is a meal definitely worth giving a try. It is creamy, tasty, and definitely worth the effort. Enjoy! I am roughly estimating that this recipe makes about 4 servings. One serving yields approximately 388 calories and 11g protein.